No Guinness For Her, Please, She's The Queen : The Two-Way VIDEO: On a tour of the famed brewery in Dublin, Queen Elizabeth was offered a pint of the famous stout. She declined. Prince Philip seemed quite interested, but passed as well. As Queen Elizabeth II looks away, Prince Philip eyes the pint of Guinness poured for them today (May 18, 2011) in Dublin. Neither took a sip. Oh, the heavy burden that comes to those who wear the crown. You can't even enjoy a perfectly poured pint. During a tour of the Guinness Storehouse in Dublin today, "master brewer Fergal Murray expertly prepared a pint" of the famous stout for Queen Elizabeth, The Associated Press reports. She declined to take a sip. Perhaps because it was before noon? 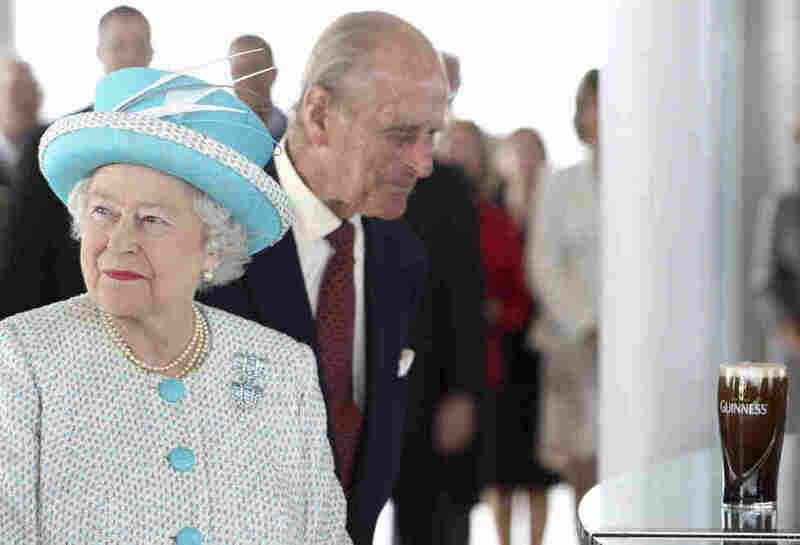 Prince Philip, the AP adds, "gazed at the brew with obvious longing but also walked away without a taste."